NA3AM was proud to host its first live event, the Encourage Courage Talent Show, in Amman Jordan on March 3rd. The event took place at the Amman Baccalaureate School, in partnership with The King Hussein Cancer Foundation. The sold-out show was the first of its kind and a championing platform for the Middle East’s artistic talent, combining the gifts of both local students and cancer outpatients of the King Hussein Cancer Foundation. 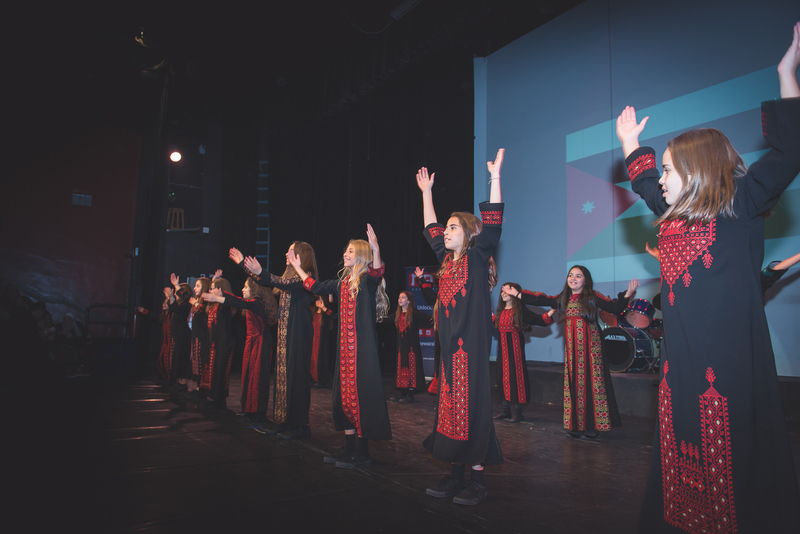 As a celebration of performing arts in and of the Middle East region, the show included singing, dancing, story-telling, music play (piano and drums), beat-boxing and a traditional folkloric dance. With NA3AM’s mission to unlock Arab creativity, we wanted to create a safe and open space for unconventional creative expression. Our platform is about inspiring Arab creativity where people are inspired to create content and art that leaves a lasting impression and affects social change. The talents displayed at the event certainly made a lasting impression on each of us! All ticket sales were donated towards the King Hussein Cancer Foundation. Also included in the show were some of our NA3AMbassadors. Laila Ajjawi created a live mural for the audience as they were ushered into the theater, which was then given to HRH Princess Dina Mired on behalf of the King Hussein Cancer Foundation. We also had Sabal Al Fayez, who is another NA3AM warrior, co-host the show on SnapChat. We wanted to give the audience an exclusive behind the scenes look on what was going on backstage and a different angle all together. Farah Al Zahrani was also present in the audience and shared her experiences of how NA3AM has supported her in her athletic journey. Our CEO, HRH Prince Fahad Al Saud comments, “The spirit of the event, the talent of the youth, both ABS students and KHCF outpatients, and the support of the Amman and KHCF community was unparalleled. My family and I were truly inspired by the courage exhibited and look forward to extending this event to other countries across the region.” This event marks the beginning of NA3AM’s event series. For more information about our upcoming events, speaker series or behind the scenes footage add us on SnapChat with @newarabmedia and follow us on our Facebook page.